It was a chilly start to today's easy ride from Wilmslow. 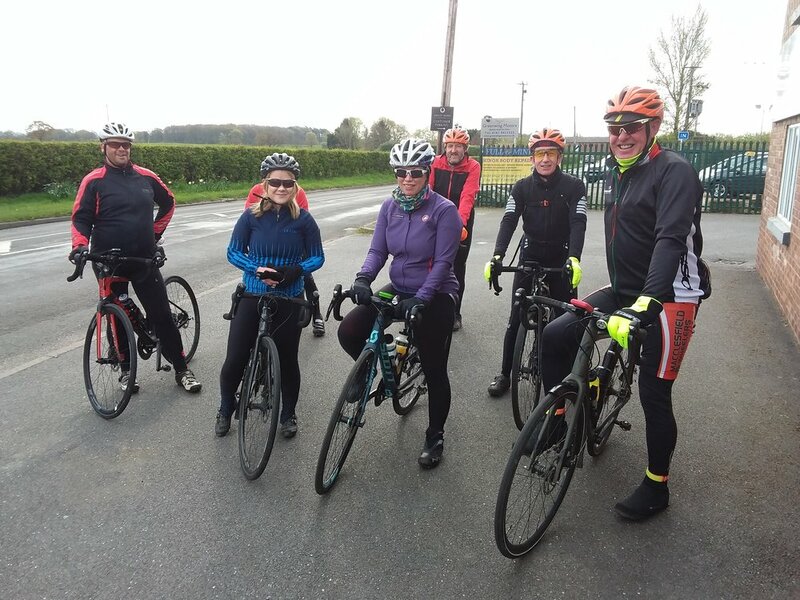 Looking at the eight experienced and relatively fit riders who had turned up (Kev, Jen, Kirsten, Jim, Griff, Dan, Simon G and me), I decided that a fast pace would help us to get warm. Luckily Simon G had his non electric bike, so we were not limited to 15mph! By Ashley cross roads we had averaged just over 16 mph, assisted by a tailwind, and had somehow dropped Kev. We pulled in for a quick photo stop, and Kev rejoined us. We arrived at Red House Farm before the rush, but after another group of cyclists, so we had to wait for our hot food. The cafe was full by the time that Yvonne arrived, but Griff tracked down an extra chair and she fitted in a quick scone before we set off again. It was still chilly and more of a head wind on the way back through the hilly suburbs of Altrincham, past airport city and along the bike lane through the tunnels. We got back to Wilmslow about 1.30pm, with an overall average speed of around 14mph, and 25 miles completed. Most of the group then headed off to Alderley Edge for an extra hot chocolate refuelling stop.